18 ft. high fortifications dating back to the 8th century BCE were discovered in the harbor of the ancient Philistine city. An archeological team headed by Dr. Alexander Fantalkin of Tel Aviv university has announced the discovery of one of the largest construction projects in the entire Mediterranean basin: a system of fortifications from the 8th century BCE, as well as coins, weights and parts of buildings from the Hellenistic period, have all been found in the archeological dig Tel Ashdod Yam – where the harbor of the philistine city of Ashdod used to be. The site is about 3 miles south of today’s thriving Israeli city of Ashdod. This has been the first deep and well organized dig at the site, following the only previous dig there, carried out by the late archeologist Dr. Ya’akov Caplan in 1965-68. 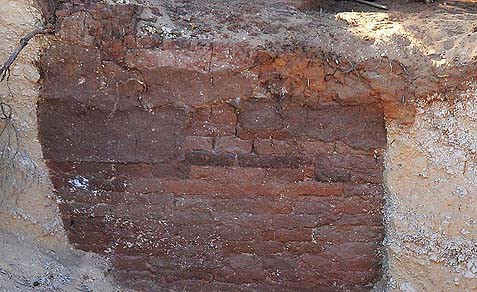 The more recent dig has brought to light the remains of an 8th century BCE fortification system – a mud brick wall comprised of internal and external dykes circling a wharf. The dig has also unearthed ruins of buildings from the Hellenistic period (late 4th to early 2nd centuries BCE), as well as coins and weights. Dr. Fantalkin said his team was surprised by the degree of preservation of these structures, from some 2,750 years ago. They’re only now beginning to come to terms with the magnitude of what they’ve discovered. An Assyrian governor ruled the southern Mediterranean basin in a time that was mired in power struggles and wars. Assyrian texts do describe a Philistine rebellion against Assyrian rule at the end of that period. Dr. Fantalkin believes the fortifications he discovered are related, one way or another, to the events on record.